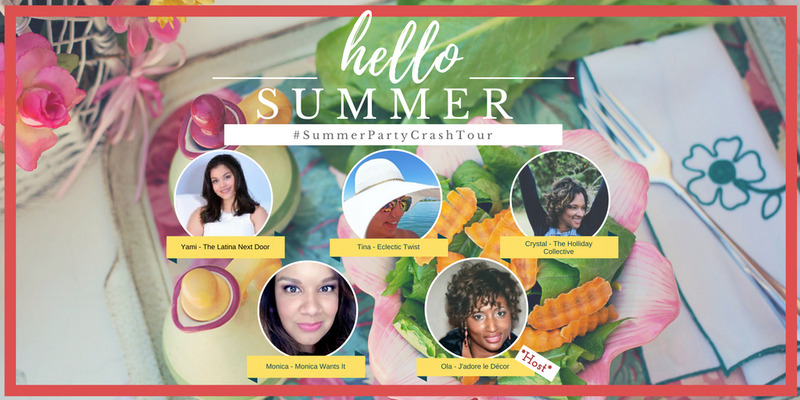 I’m here to PAR-TAY today as part of a Summer Party Crash Tour, hosted by Ola from J’Adore le Decor, with some of my lovely blog friends. Summer starts TODAY although you would totally not know that given the insane level of rain we’ve received in South Texas this week. I’m hoping the sun comes out in full force this weekend. As part of this progressive summer party, I chose to provide some summer bar cart ideas. 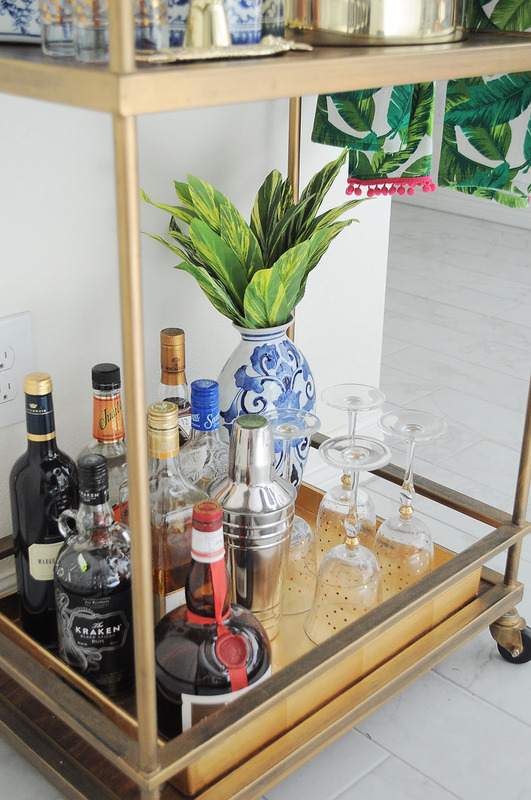 You can catch my spring bar cart tips over in this post– I love to decorate my bar cart and I probably change it up about 4-6 times a year. The fundamentals of my bar cart stay pretty much the same, but I rotate the decor, florals, candles, glassware, etc. the summer to give myself some room to breathe and relax. I got really, really burnt out after the One Room Challenge. better, I am doing better overall. 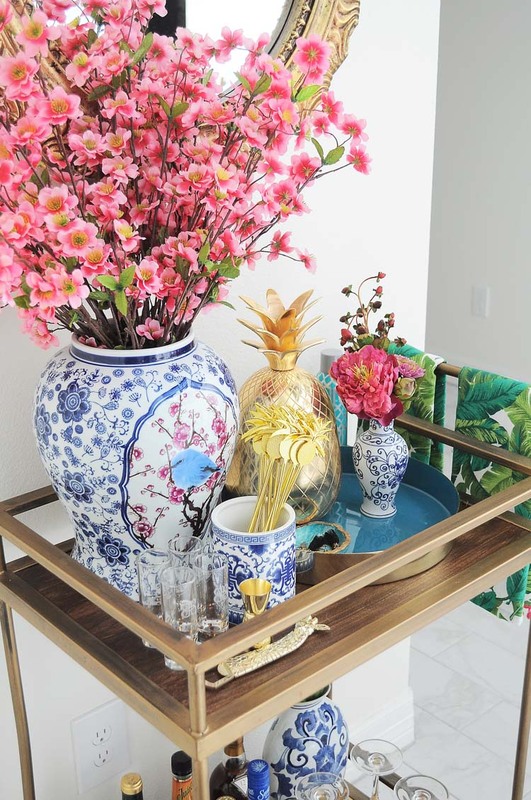 For summer, I think of crisp blue and white, so I wanted to bring some of my blue and white ginger jars and chinoiserie inspired elements front and center to my bar cart. 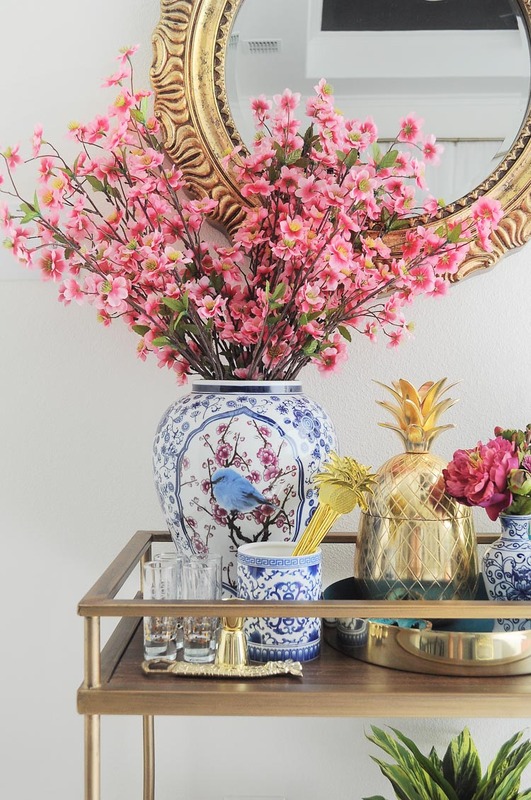 Since a gold mirror adorns the space right above it, some gold accents such as a gold pineapple ice bucket and a tray add a bit of glam gold. The HUGE ginger jar is from Tuesday Morning, and the faux apple blossoms are from Hobby Lobby. Truth be told the stems are a tad too short for the ginger jar, so I took some plastic shopping bags and scrunched them in the bottom to help hoist the branches up. A free and simple solution. Since my kitchen island is about five feet away from my bar cart, I do mix the drinks there, which is why I am free to take up so much space on the cart with pretty things. I guess my bar cart is more for beautiful storage and display than to literally make drinks. 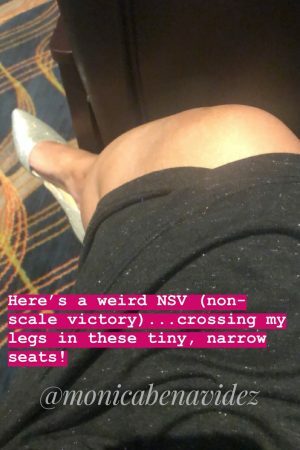 under five seconds flat from my bar cart. On the bottom, I keep my booze, glassware, and one more blue and white vase with some faux greenery. This area does collect dust easily because of life and having a dog that sheds everywhere, so I do have to dust it quite often. Taking my bar cart from spring decor to summer vibes took under 15 minutes and cost me no money. 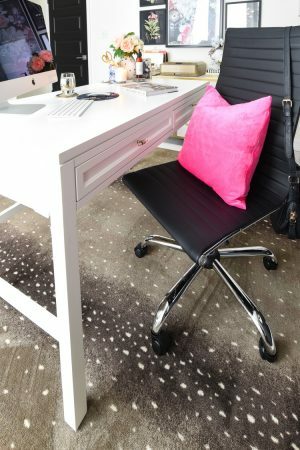 Sometimes moving a few accessories around can invigorate a space and make it feel new. 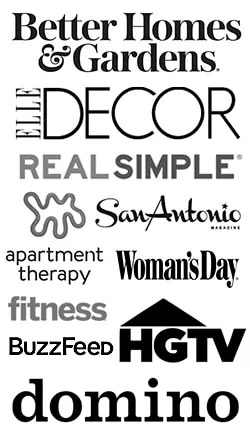 For more summer decor and soiree ideas, visit my friends below. Every time I see your bar cart it makes me want to run home and restyle mine.. lol.. yours is so perfectly styled for Summer. The pink flowers are bursting with summer warmth.. which makes you want to hit the cart for a refreshing drink! Monica, I love bar carts! No matter how much space you have they can be great for entertaining around your home. I love the way you styled yours for summer. Also, super happy that you're feeling a little better now. Take care! 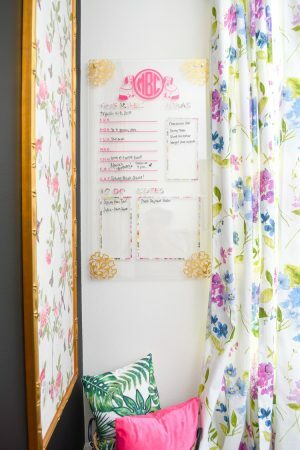 This is all so pretty Monica, and perfect for summer entertaining! I need a bar cart badly after seeing this! The best kind of styling! 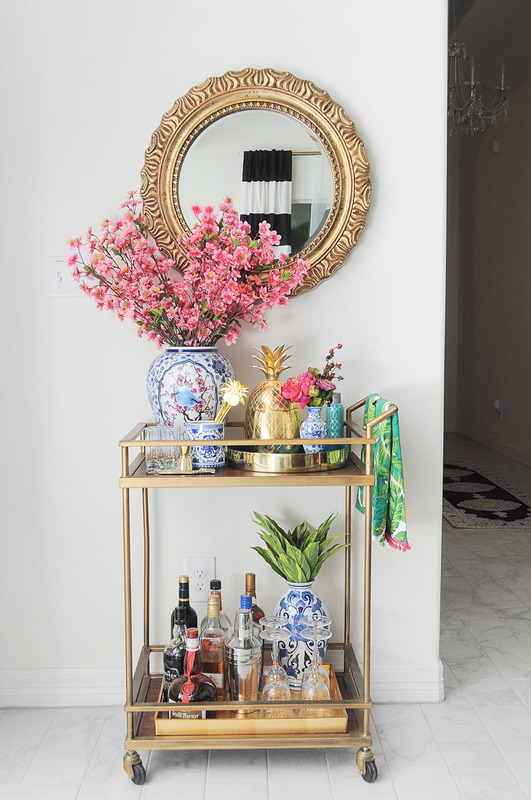 You know I love your bar cart… ..the burst of pink flowers screams YAAAAY for Summer!!! I love your bar cart, how fun is that. I LOVE the faux florals and raising them using a plastic bag! Brilliant! Your bar cart is so beautiful. 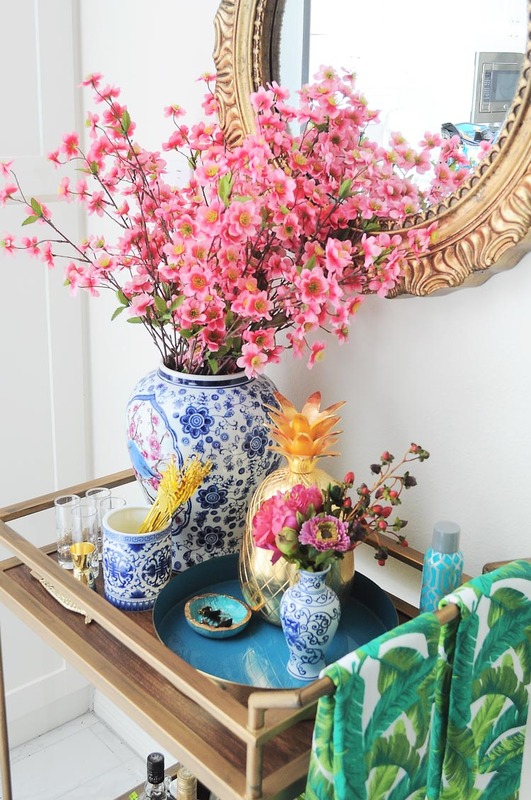 I love your bar cart and the gorgeous colors you incorporated for summer!!! I totally need to get me a bar cart now. Beautifully done as always Monica! I love a great bar cart and this certainly doesn't disappoint. And that ginger jar… very nice touch. Thanks for joining me on this summer tour!